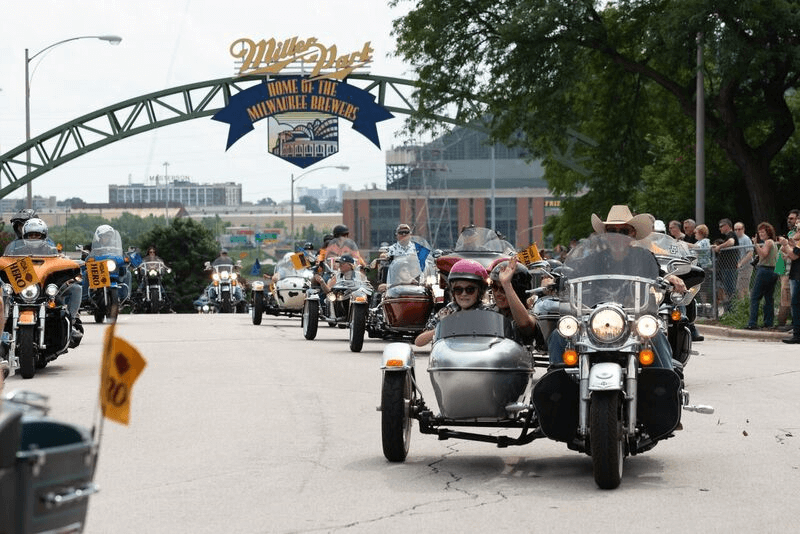 On Labor Day weekend, Harley-Davidson and the Muscular Dystrophy Association hit the streets of Milwaukee to celebrate Harley’s 115th anniversary — and the 38-year partnership between the iconic American motorcycle maker and MDA. Thousands of riders and bikes convened for Harley’s celebratory 115th Anniversary Parade on Sept. 2. 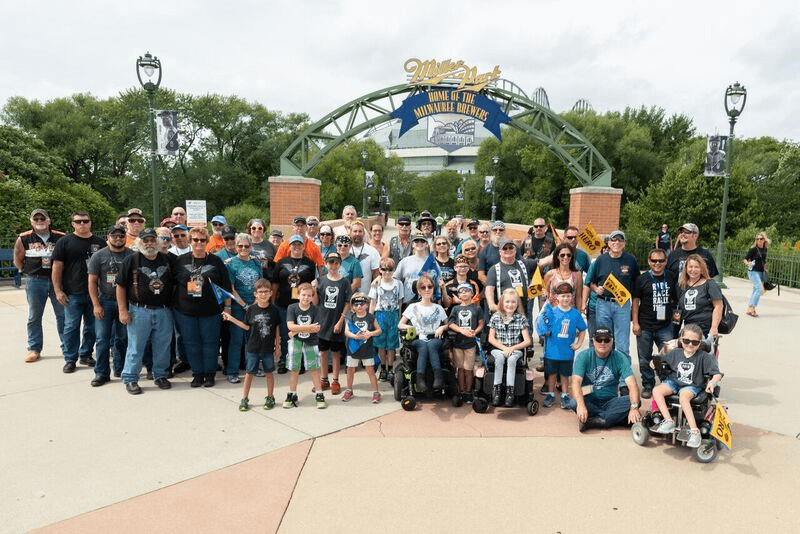 Within the parade was MDA’s Parade of Heroes, a group of current and former MDA ambassadors, MDA families and supporters who made — or rode — their way to the event in the spirit of both Harley’s and MDA’s ideals of freedom and independence. Current MDA National Ambassador Faith Fortenberry, 7, who lives with spinal muscular atrophy (SMA), rode in the parade with her mom, Leeann. Alongside Faith and Leeann were Jace Dorer, 6, who lives with Duchenne muscular dystrophy (DMD), and his dad; Mike Dimov, the No. 1 Harley fundraiser for MDA, who’s raised more than $65,000 this year alone; and 30 riders from Schaeffer’s Harley-Davidson in Orwigsburg, Penn., a dealership that’s contributed more than $2.2 million to MDA in the last 31 years. The MDA Parade of Hereoes team gathering together for a group picture before the ride. “It’s a family,” says Scarlett Ford, MDA vice president of Retail Partners, of Harley and its partnership with MDA. “My first year working with Harley [at MDA] was 1989. They were kind of mom-and-pop then — their first conferences were in the ballroom of a hotel with only probably 1,500 people. Now they’re at large convention centers with 10,000 people. But what I did see about Harley at the beginning that has not changed is the dedication they have and the personal investment they make in everything they do. Claudia Garber, manager of the Harley-Davidson Riding Academy, says it’s only natural. The parade through the streets of Milwaukee. 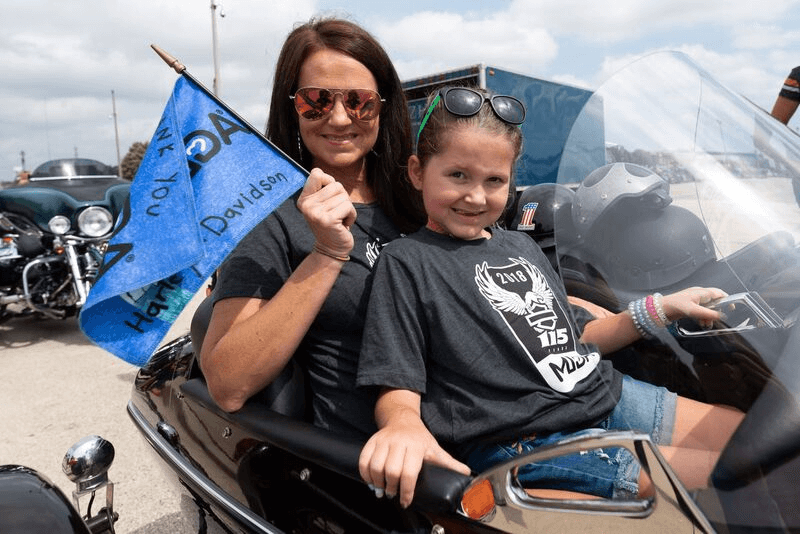 And just as riders have visited so many MDA Summer Camps to give kids sidecar rides — and the chance to feel the wind on their faces — they were there in full force at the parade. MDA’s Parade of Heroes was just one event in our 38-day #RideForStrength campaign, which continues until Sept. 30. Help us honor Harley-Davidson — and raise $1.15 million for vital research. Make a donation today and get a commemorative gift when you do.